White collar worker from by day, stop motion animator by night. 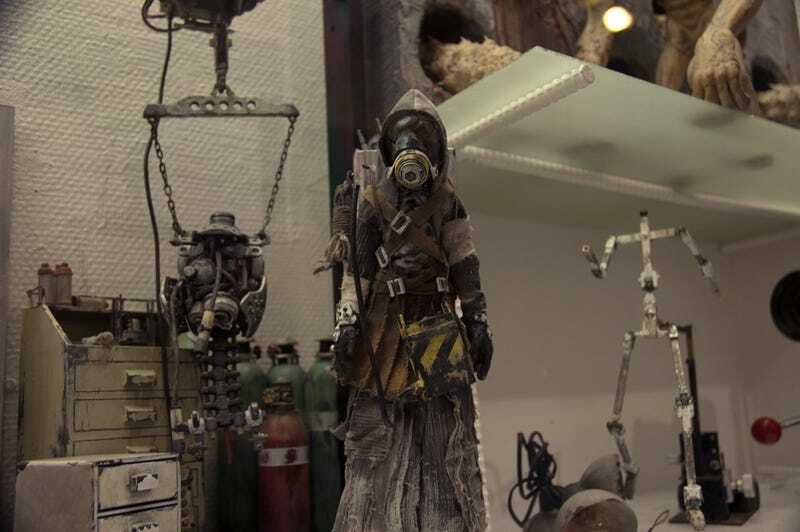 Takahide Hori – also known as YAMIKEN – successfully created his first part of his underground opus, Junk Head 1. It only took him four years. And he never gave up. I discovered Junk Head 1 a month ago and had a chance to talk with Hori at the one-day premiere showing of Junk Head 1. 1 Person + 4 Years = One Amazing Stop-Motion Animation. Though he has a background in the arts with doll and marionette making, this was Hori's first experience with stop motion photography and film making and all the skills involved were self-taught. "For a few cuts, I had someone do the CG work, but otherwise, I started completely from scratch." Hori told me. Stop motion photography is the process of creating a movie frame by frame with a camera. It's like a flip book where instead of drawing the frames, you move models bit by bit, snapping each frame and then tying them all together into a finished product. It's an extremely analog process for the modern digital age and mind-bogglingly tedious undertaking for a single person to do. Atmospherically, Hori was heavily inspired by manga artist Tsutomu Nihei, creator of the cyberpunk manga series Blame!. A huge fan of Blame!, Hori said that if possible he'd like to make a live-action adaptation of the manga series someday. Junk Head 1 has a similar dark, heavily-mechanized atmosphere, but is also injected with Hori's own tastes and sense of humor. Throughout the entire film-making process, Hori kept true to his vision and never wavered. Said Hori, "I tend to get really caught up in what I'm doing, so once I set my mind to doing something, I have to see it through." While development of Junk Head 1 took four years, Hori does not expect the potential sequel to take that long. Looking back on his experience making the film and working a day job Hori remarked, "I don't have the stamina to do that for a sequel, so if I'm able to gather the resources, I plan to quit my job and focus on filmmaking." Hori said. "It's all or nothing." Hori's current plan is to release the full 30 minute movie online – with both Japanese and English-subtitled versions – to hopefully gather interest and crowdsource or find individuals who would be willing to back his project. Hori hopes to make a 1-hour sequel in two years that he will attach to Junk Head 1 for a full 1 and a half hour feature film. "I'm putting out [Junk Head 1] and if people are interested in the sequel and are willing to donate the funds necessary to make it, I'll make it. If I can't collect enough, I intend to quit making movies altogether." While there would probably be film companies interested in providing funding, Hori does not want their money for fear that they would impede on his artistic vision. "I'm not looking for corporations or sponsors; I'm focused mainly on individuals [as backers]."